Fact: I love to travel, and I especially love it when I get to visit a new place. Family fun is far from over for us, as my mother-in-law is now in town. If you’ll remember, we had my FIL come home over the summer, and now it’s Mamabear’s turn. Their schedules weren’t quite in sync, hence the separate visits. But that’s all good because it only means extended happy days for us. This past Independence Day weekend was the first long weekend of the school year. We decided to make the most out of it by heading out to see the Mayon Volcano. This trip was something to look forward to because I’ve never been to Albay, and also because visiting local provinces helps me tutor Little MrC in social studies. See? It pays to see the sights in your own country! As luck would have it, the kiddo and I found ourselves sick with a nasty stomach bug a couple of days before the vacation. We nearly didn’t make it, but in the end the boys and I thought it would be such a shame to miss out. So we decided to go, and to just make sure to watch what we eat on the trip. Quite unfortunate, as Legazpi has great food! But still, better than not being there. But first, here are some highlights of our vacation, as seen on Instagram. These, incidentally, are also a few of my favorite things about Legazpi and our trip. Apparently, wherever you go in Legazpi, you still get to see the beautiful Mayon Volcano. This view was the savior of day 1! 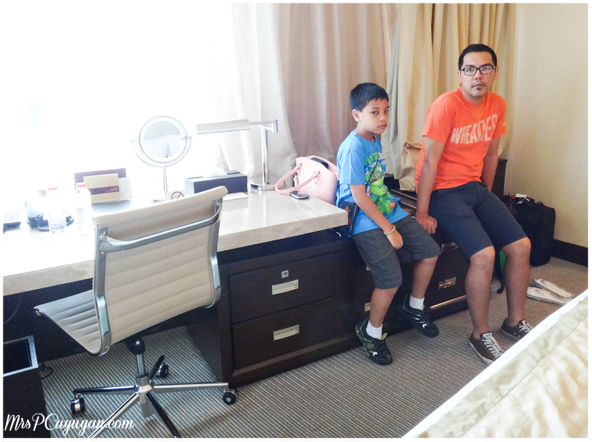 We did the Legazpi City Tour on the morning of day 2. Our guide, MJ, was really nice and had a lot of fun bits of trivia to share. I especially liked that he started us off at the Legazpi marker. It’s the perfect place for photo ops! The little guy and I enjoyed our visit to the Cagsawa Ruins. It was really hot when we went though, as it was close to noon. One look at his face will tell you just how sunny it was out there. Lol! I really don’t think it’s possible to beat the heat with a spicy drink, but MrC went ahead and tried the sili shake anyway. Yes, it was spicy, as you can see. My idea of the perfect pasalubong from Albay is honey glazed pili. I particularly like this brand, which is what my brother’s girlfriend (who is from Naga) buys for us when she goes home. So there’s our trip in a nutshell. Can’t wait to share the whole story with you guys. Now tell me, have you been to Legazpi? What was your favorite thing to eat, see or do there? I’ve been dealing with a lot of domestic drama lately because our helper has been very un-helpful. I won’t get into details because just thinking about her makes me angry. She did something unacceptable again today, and this really made me wish that I could escape to one more staycation this weekend. But alas, we are going to be mostly home over the next couple of days, and so I will write about a past staycation instead to make myself feel better. 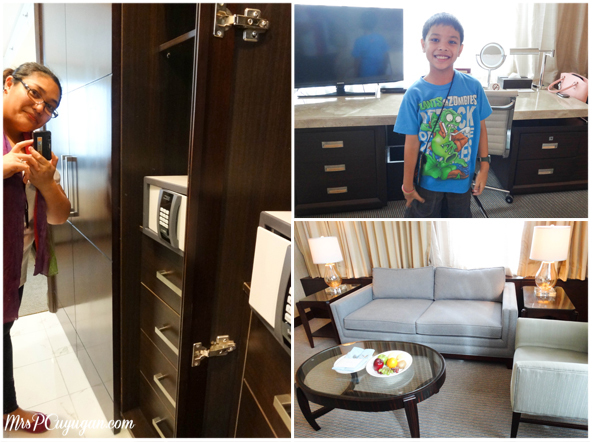 I love staying at hotels for one simple reason – I get to feel like a donya for 24 hours. I know that it sounds bratty, but it’s true. 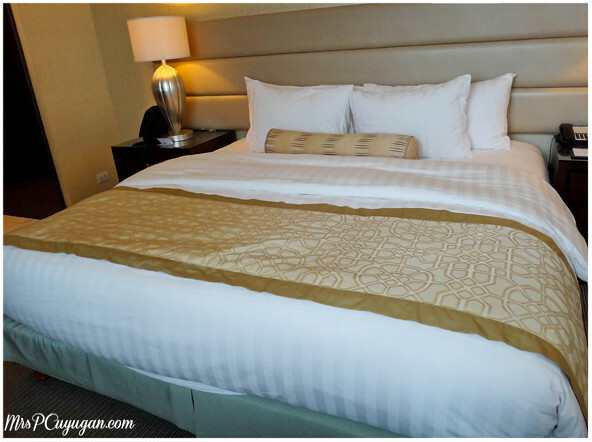 I have this list of mommy luxuries that I like to indulge in, and an overnight stay at a good hotel automatically gives me at least 5 of those things. 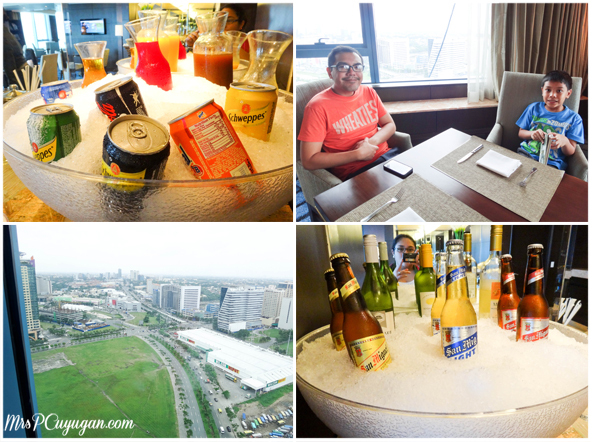 Let me explain by showing you which of these indulgences I got to enjoy during our recent staycation at Crimson Hotel in Filinvest, Alabang. As you know, we live in a really full house. As in, full of people and full of stuff. Our room is bursting at the seams with all of our things, and we even have stuff stored in the living room and outside the house. I get to leave all that clutter behind when we stay at a hotel. I know it doesn’t solve the clutter problem, but at least for a couple of days, we actually have our own space that is clean and quiet. 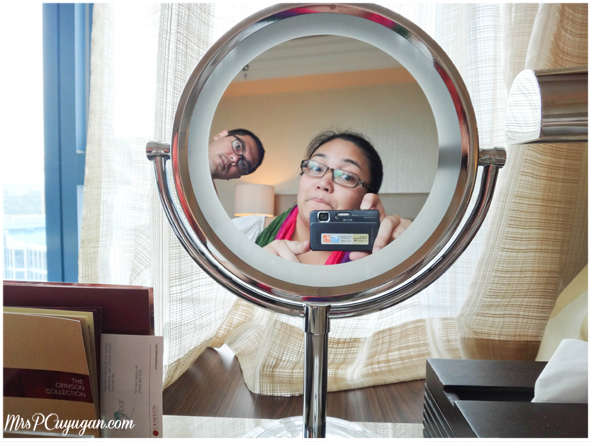 I especially loved this makeup mirror, and that it was placed in front of the window. Natural light FTW! Bidet = +1! Hot water = +1! Because the boys and I share a bathroom, we have this unspoken rule that we should leave the door unlocked in case someone needs to do something in there while we’re using it. Fortunately, ours is a big enough bathroom that we can all use it at the same time. One can shower while another uses the toilet, and the third person uses the sink. It works for us, especially on rushed mornings, but oh man do I miss my bathroom privacy. 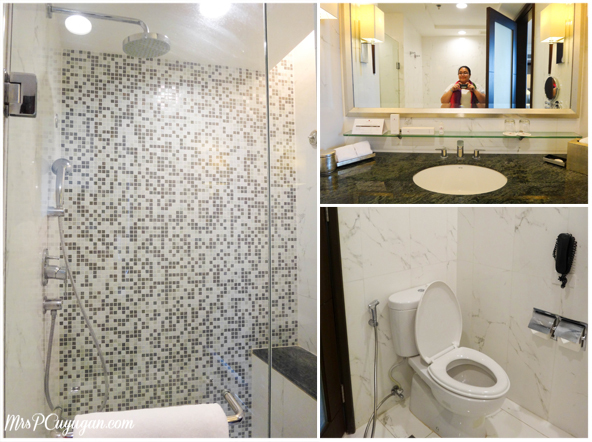 At Crimson, I got to indulge in a couple of long showers and other quiet moments in the super spacious bathroom. Oh what a treat! A delicious dinner that I didn’t have to prepare myself, complete with dessert! And it was a Mexican dinner, too! One of my favorite cuisines! 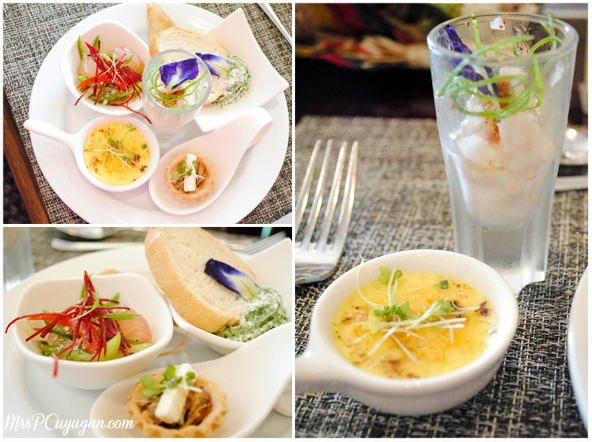 I wrote about our Sabores de Mexico dinner experience a couple of weeks ago, and you can check it out here. Funny story, at Crimson the boys decided to have me sleep in the middle. Between the two of them and the blankets, I was sandwiched in warmth! I would wake up every once in a while when it got too hot and wiggle myself out of the blankets. Then when I’d get cold, I’d wake up again and squeeze back in. This went on a few times til morning. I still felt pretty rested, though, thank goodness. Happiness is waking up to a cup of good coffee and a yummy breakfast. On weekends, MrC sometimes takes care of this for me at home, and for that I am really grateful. 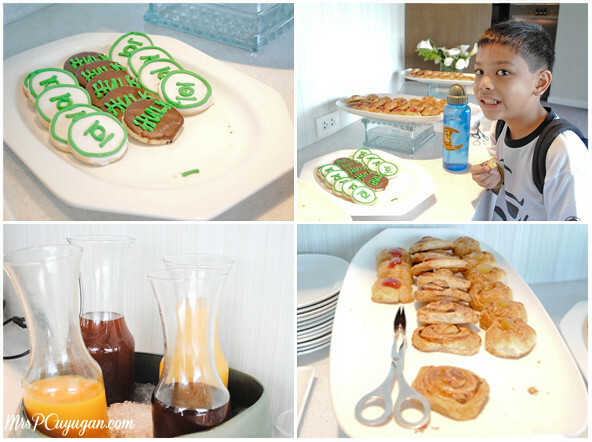 That weekend at Crimson, though, was a super treat because their breakfast selections at the hotel are really, really good! I especially loved the cheeses and cold cuts that they served, and their breads too. 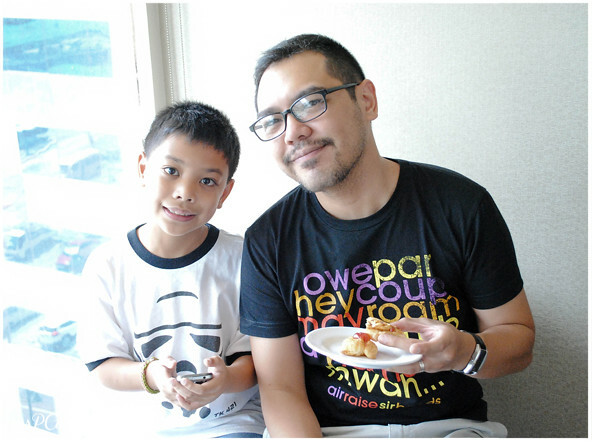 The cheese ensaymada and the cream filled doughnut were super winners. 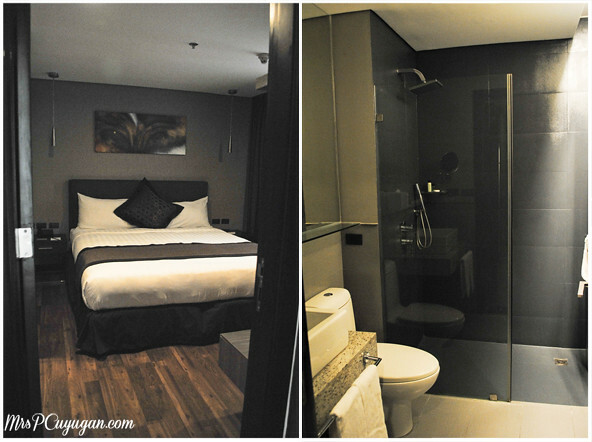 Aside from my luxury list, there’s still so much more to do at Crimson. 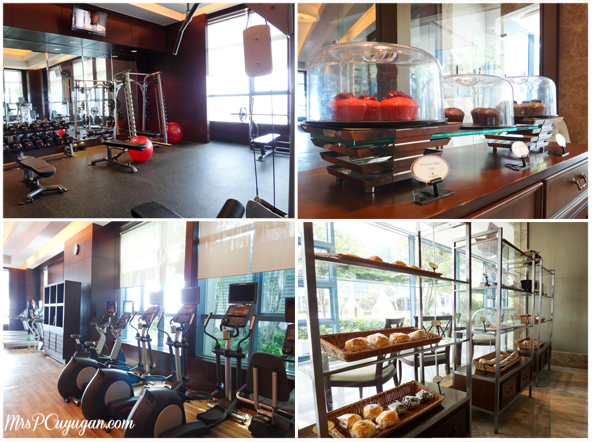 They have a really nice gym, which I probably should visit next time, especially after eating all that bread. They also have a really nice pool, which we were sadly unable to try out because it was so windy while we were there. That’s something to come back for next time. That, and happy hour at the Executive Lounge lol. Ah! And I also have to remember to take home some of that ensaymada from the pastry corner next time. So good, promise! 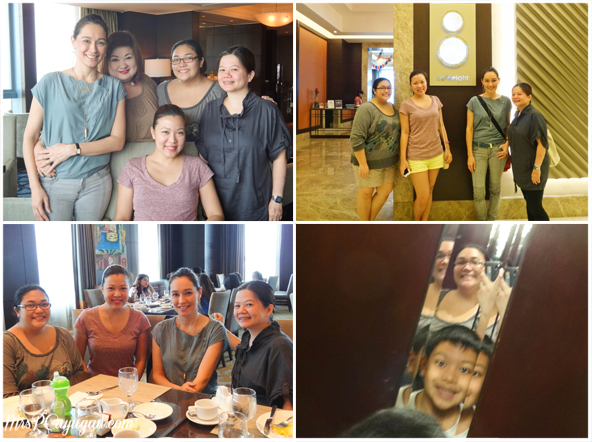 The best part about our Crimson staycation was that the boys and I were there with four of my favorite families – Michelle’s, Jane’s, Joei’s (yes, Joei and Timmy are counted as a family in my book) and Kaye’s. It’s always fun for all of us when they are around, and I love how we are starting to build such fun memories together as a group. Since Little Miss QC was with us that weekend, we were officially ABC+K! Cute, diba? 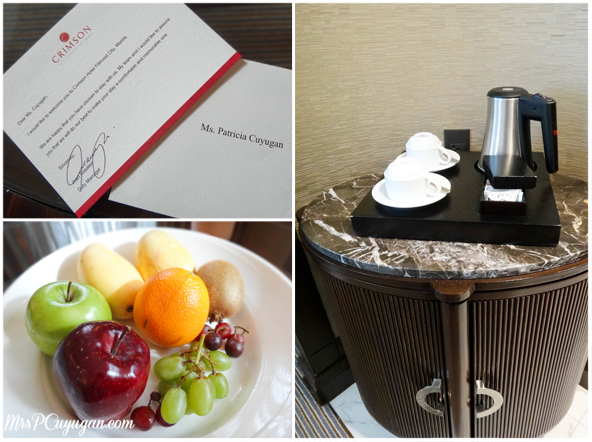 THANK YOU so very much (again) to our lovely hosts, Twinkle Lacsamana, Karina, and the wonderful staff at Crimson Hotel. The boys and I had the best time and we can’t wait to come back! And super duper thank you, Jane, for arranging this for our little sisterhood. We love you! 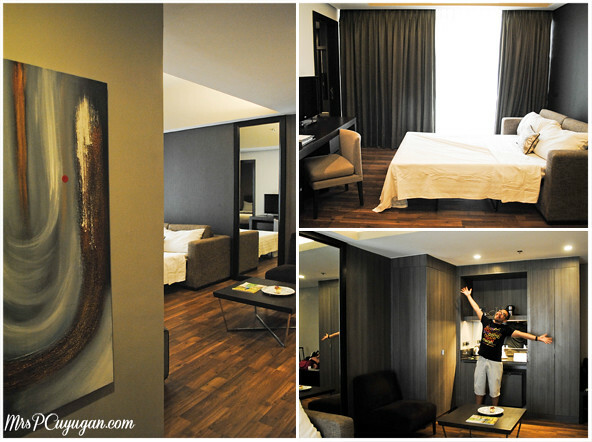 Have I told you guys how much I love Taal Vista Hotel? A week after our dinner date at QiWellness Living, MrC and I escaped for a quick pre-anniversary lunch at Taal Vista. It was a great time to be there because Chef Fernando Aracama was in the house. 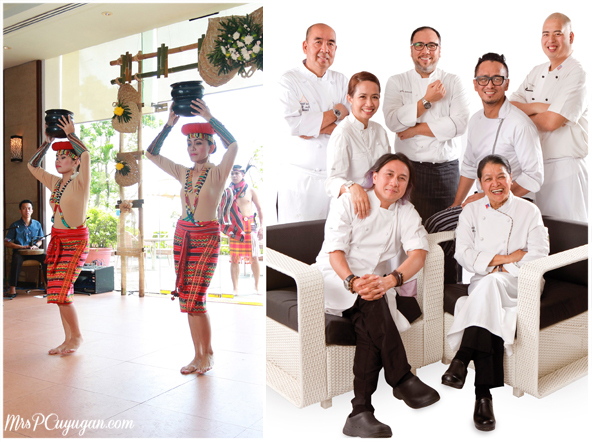 He was Cafe Veranda’s guest chef on the first weekend of the hotel’s Culinary Gems: A Festival of Filipino Flavors event. We arrived just in time to catch the opening ceremonies. 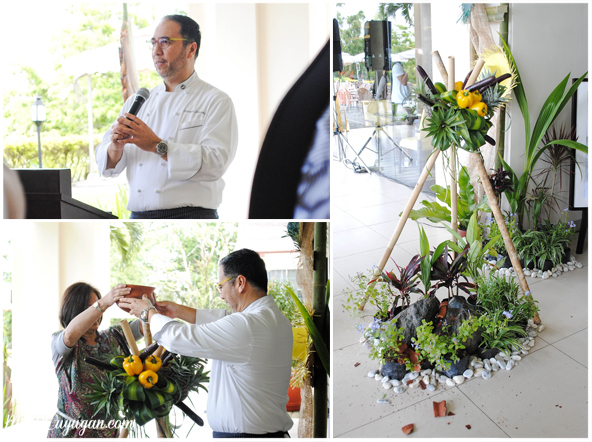 Instead of the usual ribbon cutting, Chef Aracama and Peggy Angeles of SM Hotels and Conventions Corp. (and my seatmate at lunch!) broke a clay pot over an arrangement of fruits and vegetables. I’m not sure if this is symbolic, but if it is, it probably means something nice. Lol. 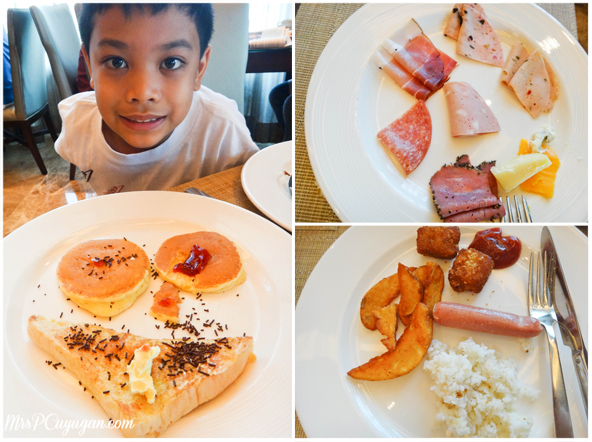 The boys and I had lunch at Cafe Veranda during our weekend staycation at Taal Vista last year. 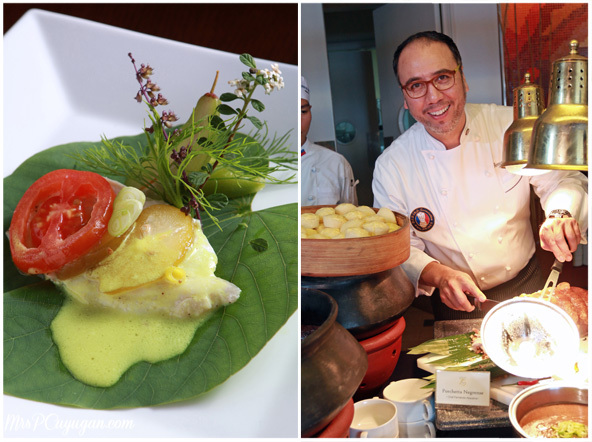 I was excited to see what the hotel’s Executive Chef, Edwin Santos had prepared, and of course how Chef Aracama’s creations would accent the Filipino food buffet. As always, Chef Edwin did not disappoint. 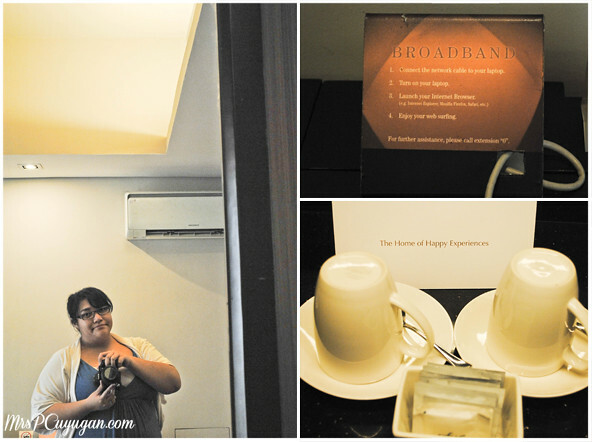 Everything from the hotel’s signature Lumpiang Ubod to the Brazo de Mercedes were so delicious. 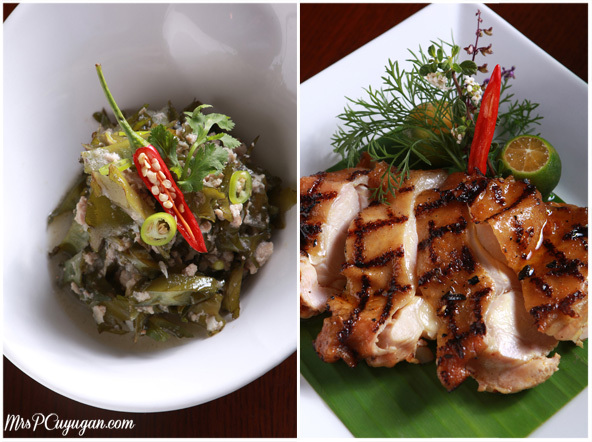 Chef Aracama’s Ilonggo creations we also extremely good. I couldn’t get enough of how tasty all of his dishes were. 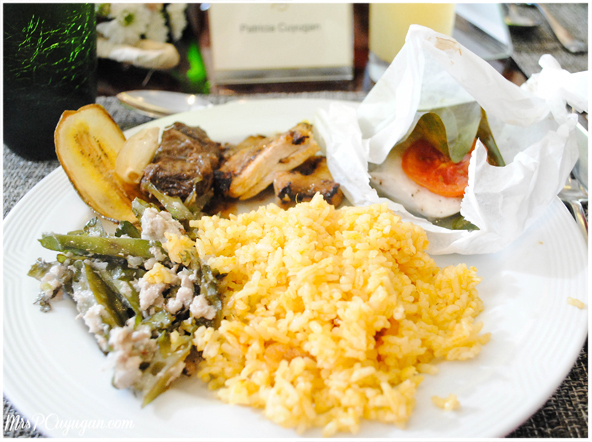 I couldn’t get enough of the Beef Adobo sa Tuba and the Sigarilyas Gising Gising Style. I started my meal off with a plate of assorted appetizers. My favorites among everything I got was Chef Aracama’s Malunggay Dip and Pan Tostado, the Salted Egg Brulee, and the Ginataang Langka Triangle. Plate #2 was loaded with all of the Aracama dishes that I found interesting – Kalkag Fried Rice, Sinanglay na Isda en Papillote, Chicken Inasal, Beef Adobo sa Tuba and the Sigarilyas Gising Gising Style. I would seriously have gone back for a second helping of the exact same plate if I had the space for it in my stomach. Yes, I had a third plate, but it was a small one. I had forgotten to get Porchetta Negrense during my second round at the buffet, so I took a bite off of MrC’s. It was so good that I of course had to go get a few slices for myself. The husbandry had his with the uber delicious vinegar that they were serving that day, while I opted for the lechon sauce. I was expecting the usual lechon liver sauce, but this one had an extra hint of spice and a bite of sourness to it. Oh my golly, so good. 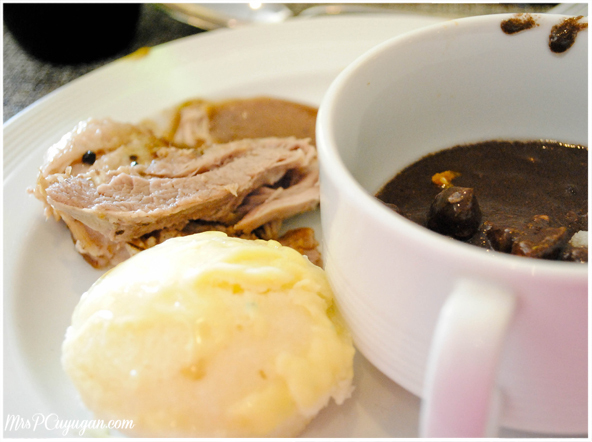 I also had some Dinuguan and Puto, a Filipino meryenda favorite that I can never skip, no matter how full I already am. I wish that I could have eaten some more but I was just about ready to burst. 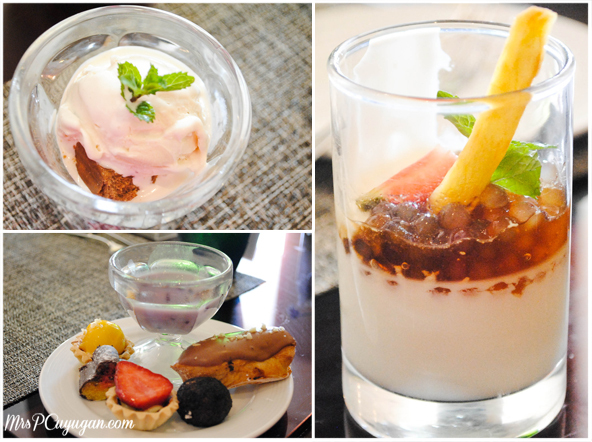 So, it was time to end things with a selection of sweet desserts. Chef Aracama’s Chocnut Ice Cream was the highlight of my sweet treats. I split a Buko Panna Cotta (also by Chef Aracama) with MrC because I just couldn’t finish one whole on my own. It was one of those non-jello-ish panna cottas, so I was happy. And, I couldn’t say no to Chef Edwin’s Frozen Brazo de Mercedes, because it really is superb. An amazing cultural show and excellent Pinoy food. What more could you ask for? THANK YOU so very much, Celine Arenillo and Treena Tecson for having me and MrC over at Taal Vista again. We love celebrating anniversaries and birthdays with you guys hehe! Thanks also to my fun to kwento with seatmate, Peggy Angeles for letting me know which dishes I really ought to try. See you guys (hopefully) this Halloween! 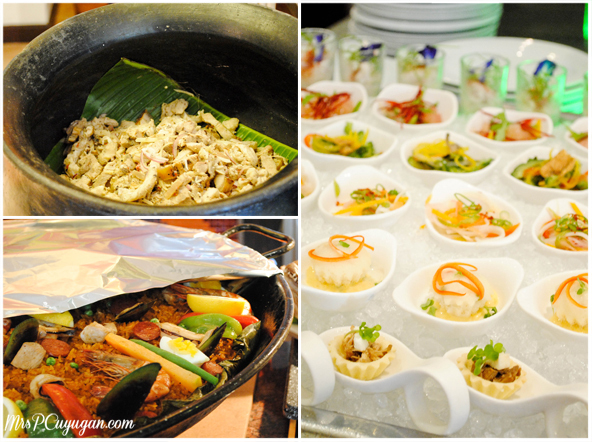 The Culinary Gems Festival of Filipino Flavors continues on until November at Taal Vista Hotel’s Cafe Veranda. 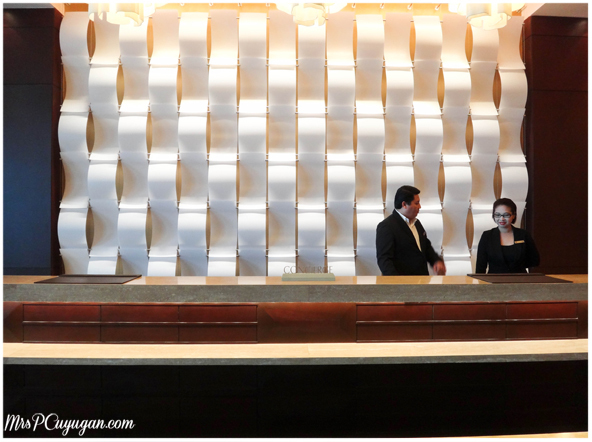 Saturday lunch and dinner buffet, and Sunday lunch buffet costs PHP1350 nett per person. For inquiries, you may call +632 917-8225.